In September of 2003, TNT commissioned Beckett Media to create an official magazine for Neopets. The new publication's features included in-magazine activities, short stories, Flash game guides, news on upcoming site events and more. 26 issues of the bi-monthly magazine were produced before its cancellation in January 2008. The venture got off to a surprisingly successful start, the issues were sold at $10 (USD) each, with back issues available online. Some of the magazine's popularity may have been due to the miniature plushies that were sent out to new subscribers, which could be obtained nowhere else (other than second-hand). At the time of writing, some back issues are still available for purchase here. However, be warned that many issues have already sold out, since they are no longer printed. Alas, the Neopets magazine is no longer published. Thank you for being a faithful reader, though. We hope you enjoyed our magazine when it was offered. Beckett Media sent a notice to subscribers that after the final issue of the magazine, their pre-paid subscription would be replaced with the new magazine 'Beckett Plushie Pals'. This publication would include some Neopets news, but would also feature news and merchandise related to other companies such as Webkinz, Club Penguin, TY Beanie Babies, and others. In October 2009, another substitution occurred; this time, 'Beckett Plushie Pals' was replaced by 'FUN! Online Games.' This magazine focused more on various kid and family oriented online gaming sites such as Neopets and the other sites mentioned above. According to the company, in its first month of publication the new magazine had 100,000 readers. Responding to questions about the changes, Beckett Media explained that it was Viacom who had chosen to cancel the magazine. They requested that any complaints on the subject be directed to the Neopets Team. Not to be confused with the online Pet Spotlight, the magazine's Spotlight described the achievements, characteristics, and attributes of a different species each issue. It often gave helpful tidbits of information about the species. In Issue 10, for instance, the spotlight featured Ixi, and detailed famous Ixi characters, the number of Ixi in the world and even the date of their first appearance in Neopia! There were plenty of facts and figures that the average Neopian might have missed. Don't worry if you can't get your hands on a magazine, though-- Jellyneo has its own extensive Species Encyclopaedia you can check out at your leisure! Oh hey, we have some of these here on Jellyneo, too! These in-depth game guides had plenty of tips and tricks for the readers. There were usually three to four guides per issue. Each one included the basics of gameplay, tips on getting through tougher levels, Neo-friendly cheat codes and a detailed rundown of special abilities and secrets, not to mention some pretty insightful strategies. If you were lucky, you might find a guide with step-by-step instructions and screenshots. With these helpful articles, you were sure to make the high score chart in no time. These creative Neopian tales were spread sporadically throughout the magazine. They were usually focused on the main theme of the magazine, but some were just there for a little bit of fun. If you would like to see some of the characters featured in these stories, feel free to check out the Book of Ages search here. We're always looking for information on characters we haven't yet catalogued, so if you own any of the magazines and notice we're missing someone, feel free to write in! These sections were sometimes just published to fill magazine space, but occasionally they proved surprisingly insightful. Some of the magazine's success was down to helpful articles like "How to Earn Neopoints" and "Gallery Decoration 101". A "top 10" list would also appear in most issues; these showed things such as the ten most popular plushies or avatars at the time of publication. An extended version of the Editorial in the Neopian Times, this editorial answered questions sent in by users and was found in the opening pages of the magazine. The middle pages of each magazine were usually taken up by a Fan Art gallery. Users of all ages could submit artwork to Beckett Media, who would choose the best submissions for each issue's gallery. As well as the Fan Art pages, the centre of the magazine also contained a free Neopets poster. The posters featured the magazine cover image on the front and a TCG checklist on the back. It was a useful tool for collectors, as well as being great for covering cracks in your wall. 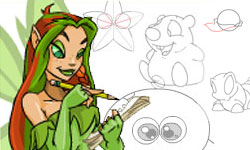 Much like Neopets' How to Draw section, this feature provided tutorials for drawing accurate Neopian art. The pictures explained in these lessons were usually related to the magazine's theme or cover image. Each magazine featured an avid fan's collection of Neopets memorabilia. Readers sent in their name, a picture of their collection, and a description in hopes of being featured in the next magazine. The Marketplace was a catalogue of Neopian goods such as plushies, pillows and more that were sold through the magazine. You could also buy other Neopets: The Official Magazine issues here. 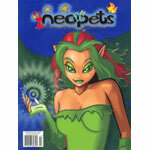 The Official Magazine was published while the Neopets TCG was at its prime. Each issue featured an article with the hottest tips, tricks and strategies to help you beat your friends, as well as information about local tournaments. There was also a detailed list of all of the newest and most popular cards. Issues 21-26 included "word scramble" puzzles that could be solved to reveal a keyword. This keyword could then be entered into the main site for a prize. The prize redemption page is still available here. All solutions award 1000 NP. For a while, codestones would also sometimes be given out, but this no longer seems to be the case. You can still go to the prize redemption page to claim the prizes for issue #21 to #25 (issue #26 page is not available), type the solutions above in lowercase (woowoogrub, pandaphant, yooyuball, snowmuncher, money tree, frank sloth) and hit submit to receive 1000 NP for each issue.